There are few rare minerals as iconic and sought after as gold. This rare and shiny mineral has many unique qualities unlike any other rare rock and mineral found on earth. In small quantities, gold is highly ubiquitous in nature with historic instances of gold rushes that have shaped populations around the world. This begs the question: why are people fascinated with the discovery of gold? 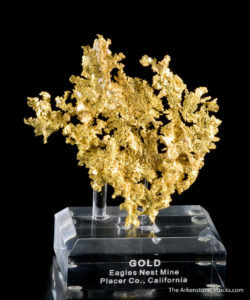 Gold has a long history of playing the unique role of currency, works of art, and a remarkable conductor used in sensitive technologies. 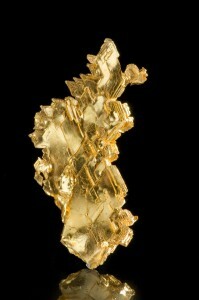 Gold also has unique physical characteristics that make it the most malleable and ductile of all the heavy metals. In fact, 20 grams of gold material can be flattened into a 6 square meter sheet with a thickness of 0.00025 centimeters. The most widely available gold compounds are auric chloride and chloric acid, which gives the material its incredible resistance to halogens and most reagents. These chemical properties make gold perfect for jewelry works of art, because it retains chemical structure when exposed and doesn’t corrode or tarnish easily. While the physical and chemical characteristics of gold are remarkable, much of the desire to collect gold comes from its historic value. For nearly 2,600 years, gold has served as a representation of wealth. Its beauty, rarity, and high resistance to tarnishing and corrosion have helped preserve many historic coins and currency pieces. There are many historical records and stories of gold being used major ceremonies, from the gold leaf used in the death mask of King Tutankhamun to descriptions of gold gifts by the three magi in the story of Jesus’ birth. Gold continues to enjoy an abundance of success in modern history. When most gold collectors think of gold booms, the first that comes to mind is the California Gold Rush of 1849 that helped bring settlers to the western United States. Before 1848, the non-native population of California was less than 1,000. When gold was discovered in the Sacramento Valley, this number grew to 100,000 for the four-year rush. By the end of the decade, the population of California boomed to 380,000, helping to solidify America’s industrial revolution from the Atlantic to the Pacific. The California Gold Rush of 1849 was a significant event in American history. However, the longest gold rush in world history occurred in Minas Gerais, Brazil, from 1690s into the 19th century. The Brazilian Gold Rush saw a movement of nearly 1 million people into south-eastern Brazil, aiming to strike gold and claim their fortunes. Recently, the Brazilian mines of Mato Grosso State have yielded a brilliant find of natural gold specimens. The most valuable gold specimens are highly lustrous, complex in their shape, and shine a perfect 24 karat gold color – making this one of the biggest surprises in mineral findings this year. Luckily, the Arkenstone has been able to recover many of the finest gold specimens from Brazil, all in their intricate and natural forms. These specimens came to the Arkenstone during our Tucson Gem and Mineral Showcase, one of our many shows held throughout the world. Don’t forget to visit the Arkenstone’s Dallas Mineral Collecting Symposium at the Eisemann Center! The symposium will feature world-renowned speakers to talk about their latest collections and rockhounding experiences in the field. We’d love to meet with you and talk about the various collections! Shop Natural Gold Specimens on iRocks!